We can help you apply to the Court of Protection to be appointed as deputy for a mentally incapacitated person. Deputies need approval from the Court of Protection to buy or sell property on behalf of mentally incapacitated persons. 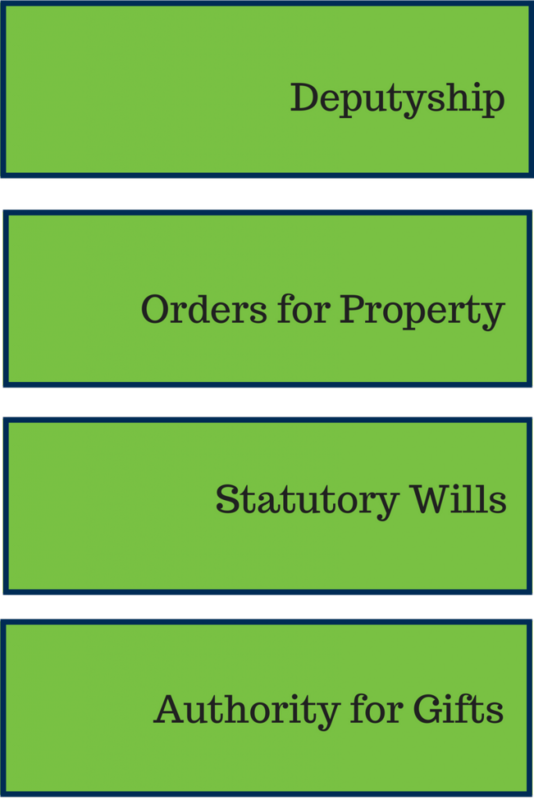 We can assist you to get the authority you need. The Court of Protection considers applications for Statutory Wills to be prepared for people without the mental capacity to give instructions for a Will for themselves. We can support you in submitting the right kind of evidence to the court. The authority of the court is required to make large value gifts from the assets of mentally incapable people. The rules are strict. We can help you to present your case for a gift to give you the best chance of success. The Court of Protection also has authority with regard to Lasting Powers of Attorney (LPA) and Enduring Powers of Attorney (EPA). The Office of the Public Guardian refers cases to the Court of Protection where there it has a reason to believe there may have been wrong-doing or mismanagement by an attorney. We can help you if you are an attorney or deputy who is being investigated or if you wish to apply to the Court of Protection for an attorney or Deputy to be removed. Who uses our Court of Protection Services? Ask us for an initial discussion without obligation. Find out more about our fixed fee Court of Protection Services from £950 plus disbursements and court fees. Call us on 0115 7722129.